St Teilo’s Church, Llantilio Pertholey, Monmouthshire. Os grid ref: SO 3114 1632. St Teilo’s Church at Llantilio Pertholey about 1 mile north of Abergavenny (Y Fenny), Monmouthshire, stands in a secluded hollow just off the Old Hereford road, in a lovely, peaceful setting within what looks to be a partly circular churchyard. The church is largerly medieval but there are many different periods built into the structure which can be a bit confusing, if not daunting. At the back of the church there is an ancient yew tree that is said to be 1,200 years old, so there ‘may’ have been a place of worship here in the 8th century? And there is a medieval churchyard cross (south-side) which is now a war memorial. According to ‘The Legend’ an unidentified holy man called Bevan came here with some companions and established a cell. Bevan was a follower of the renowned Welsh churchman, St Teilo (Theliau), who is said, according to legend, to have died at his monastery of Llandeilo-Fawr, Carmarthenshire, in 560 AD. Teilo had earlier been bishop of Llandaff, succeeding St Dubricius (545). The name Pertholey (Bertholey) and Bertholiau is thought to refer to “a defiled gate” or entrance, but other than that the meaning is uncertain. So why was it defiled? Could it refer to “martyrs”? We know that Bevan was buried here, but he seems not to have suffered martyrdom. Fred Hando in his work ‘Hando’s Gwent’ 1987 refers to ‘The Book Of Llandaff’ for information as to the beginnings of this place; he also says: Pertholey is Porth Halauc – a polluted entrance. The hamlet of Llantilio Pertholey is just north of Mardy on the Old Hereford road, while Abergavenny is 1 mile south, and the more recent A465 road to Hereford is just a little east of the church. At the edge of the churchyard the river Gavenny makes its way toward the town, and then to Llanfoist. St Teilo’s stands in the shadow of Skirrid Fawr, holy mountain to the local people. A couple of legends, or myths, are associated with the Skirrid – probably in connection with the part of the hill that has slipped away due to an earthquake at the time of Christ’s crucifixion, or it was caused when the giant, Jack o’ Kent tried to jump from the Sugar Loaf to the Skirrid – but missed his footing. There are also remains of an ancient Roman Catholic chapel of St Michael on the top of the hill, now just a few stones in a little grassy hollow. Another View Of St Teilo’s Church, Llantilio Pertholey. In the 15th century porch there is an ancient holy water stoup (sadly it is broken) and a wooden alms-box (1704). The interior is spacious but everywhere seems to be ‘put to good use.’ Probably the oldest part of the church is the north tower with its 14th century entrance to the stairway, though there may be some earlier, 13th century masonry in the nave, according to Mike Salter in his work ‘The Old Parish Churches Of Gwent, Glamorgan & Gower’ 1991. The east and south arches are of 1350-1400. It is worth pointing out that some of the arches are ‘all out of true’, seem to lean inwards and are irregular, while the two chantry chapels (north and east) date from the 15th and 16th centuries respectively, the 15th century north chapel (Triley Chapel) has a depressed arch, a timber two-bay arcade, a crude stone altar with consecration crosses was originally a stile, a recess in the wall that may have once housed a tomb and some medieval tiles in the floor [church leaflet]. The south chantry chapel (Wernddu Chapel) was added in the 16th century. In the nave the west window dates from 1729. The east chapel (Neville Chapel) is particularly nice as it has graceful oak arches supported by stout oak columns carved with flowers and cable pattern, according to the historian Fred Hando ‘Hando’s Gwent’ 1987. The octagonal font has a full size bowl and its lid is recent; the angles at the base of the font have carved fleur de lys, according to the church leaflet. I think the most interesting part of this church is the “squint” or hagioscope which afforded a good view of the altar. Canon E.T. Davies in his book ‘A Guide To The Churches of Gwent’ 1977, says that: “It is around the chancel arch that the visitor should looks for squints or hagioscopes, especially at the end of a north or south aisle. These apertures enable those sitting or, more probably standing, in the aisles, a view of the high altar; they are not leper squints.” The piscina in the wall to the right retains some of its original colouring [church leaflet]. So, all in all a very nice interior. Cross/war memorial in St Teilo’s churchyard. Outside in the churchyard (south side) stands a beautiful war memorial on a very large chamfered base – the monument is modern but the base is medieval. 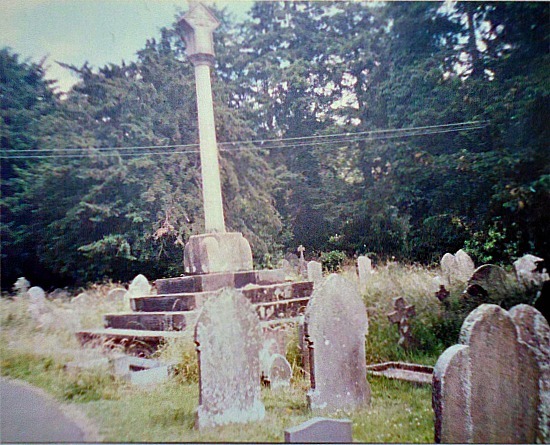 The churchyard cross used to stand on the base but was destroyed in the 1640s. Close-by, to the west an ancient yew tree that is hundreds of years old and could, therefore, date back to the Dark Ages (the 6th century) when Iddon, son of King Ynyr, gave this piece of land to Llandaff and St Teilo on which to build a church. Above the porch there is a nice shield-shaped sundial. 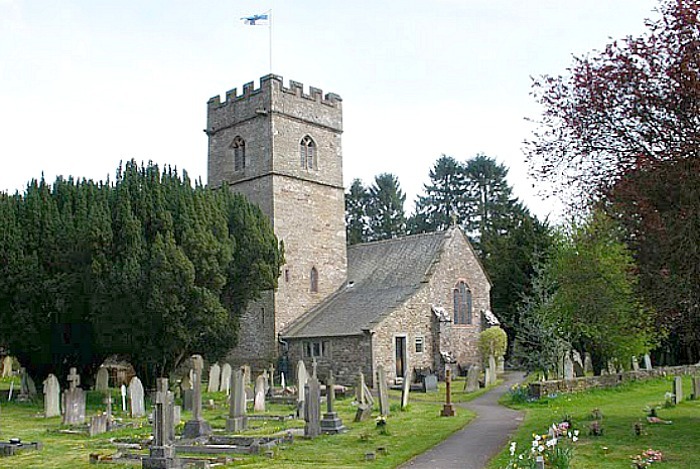 Over on the south-side of the Skirrid (Ross Road) stands the church of St David at Llanddewi Skirrid, while a few miles over to the north-west is the gorgeous little church of Bettws -these two buildings are cared for, and ministered by, the incumbant of St Teilo’s. Salter, Mike., The Old Parish Churches Of Gwent, Glamorgan & Gower, Folly Publications, Malvern, 1991. Davies, E. T. Canon., A Guide To The Ancient Churches Of Gwent, The Griffin Press, Pontypool, Gwent, 1977. Hando, Fred., Hando’s Gwent, Blorenge Books, Abergavenny, Gwent, 1987. The church leaflet (a very useful little guide). Barber, Chris., Mysterious Wales, Paladin (Grafton Books), London W1X, 1987. 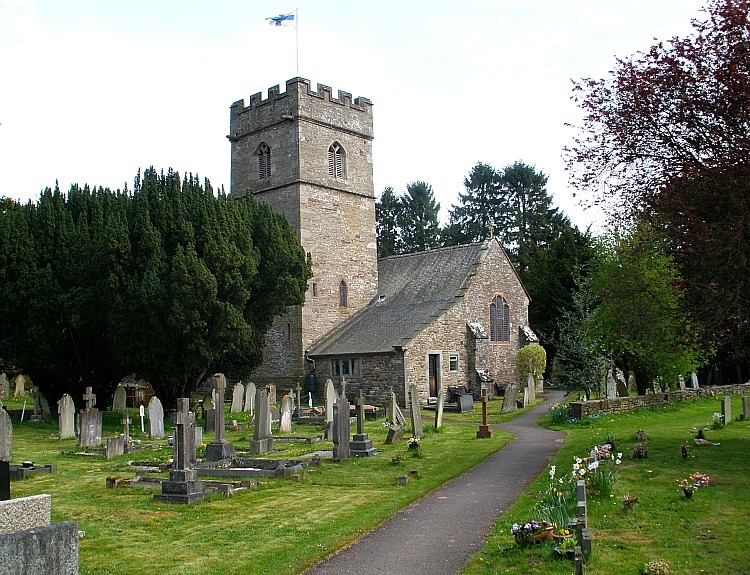 Categories: Ancient Churches & Chapels | Tags: Church of St Teilo at Llantilio Bertholey Monmouthshire, St Teilo's Church at Llantilio Pertholey in Monmouthshire | Permalink. Hello BarryS, I think St David’s at Llanddewi Skirrid is a more modern church, maybe Victorian, although it stands on an ancient site, and so there would have been earlier churches here. The church/chapel at Bettws is quite old, probably medieval with some modern bits. It was originally a chapel of ease.